About a year later, I made a delightful cranberry quince version of the bars (a scrumptious combination) and added sweet almond paste to the batter. But those, too, needed some revising — and once again, before I could finalize the recipe, quince had disappeared from the market. So here I am, back at the beginning with cherries. This time, I brought along the sweet almond paste and everything I learned along the way. And cherry season is still in full swing as I write this. Huzzah! With softened almond paste beaten into creamy butter, a burst of bright orange, and warm vanilla, these bars offer a fantastic flavor balance. Thanks to the two-level baking method, the bottoms and edges are toasty and sturdy, but the bars remain moist and soft inside — a perfect bed for jammy, wrinkled baked cherries. Amaretto-y and not too sweet, they can be drizzled with complementary white chocolate, or not — and they’re as welcome on the breakfast table as they are after dinner. I prefer to use larger cherries which tend to stay in place and don’t shrink down too much, but any size will do. Position one oven rack in the lowest position and one at middle height. Preheat oven to 350 F.
Prepare a 9×13” baking pan: If using a pan from which you’ll be cutting the bars directly (such as glass), simply grease it. If using a pan from which you don’t want to cut the bars directly (such as scratch-able metal), grease sides lightly and line bottom with a generous sheet of parchment that hangs over on the long edges (you’ll use it as a sling later). Set prepared pan aside. In a medium bowl, whisk almond meal to remove any lumps. Sift flour, baking powder, and salt over the almond meal. Stir until blended. Set aside. In a large mixing bowl, beat the butter and sugar on high until fluffy. Reduce speed to medium. With mixer on, gradually add the lukewarm (soft) almond paste, in grape-sized pieces. (I pinch pieces off the log of almond paste and toss them in.) Once all almond paste is added and incorporated, beat in the egg yolks one at a time, followed by the extracts. Stopping to scrape bowl often, add the dry ingredients and mix until incorporated. Finally, fold in the orange zest until evenly dispersed. Transfer dough to prepared baking pan and spread evenly to edges. 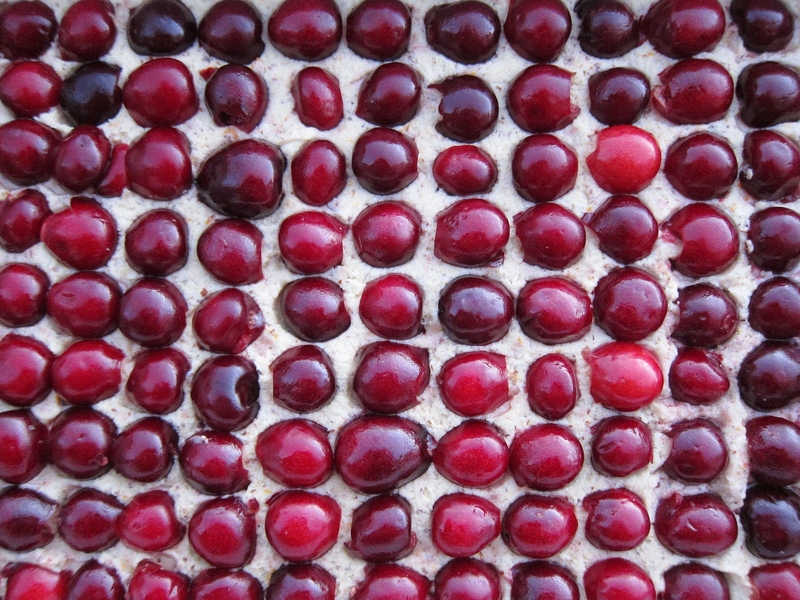 Add the cherries, cut side down in tight-fitting rows, and press them down gently. Keep in mind that they’ll shrink and will want to move around while baked. Bake on the bottom rack for 10-15 minutes (10 minutes if your pan is glass or very dark metal, or if your lowest rack is especially close to the heat source). Move pan to center rack and bake 20-25 minutes (longer if the bottom-rack step was shorter). A total bake time of 35-40 minutes is generally about right. When ready, edges will be browned, area between cherries should look toasty, and cherries will be wrinkled. Remove from oven and let cool completely in pan to room temperature. If you used parchment, gently lift the cookie slab and transfer to a cutting board, and carefully remove and discard the parchment. Cut the bars as desired (my favorite is on the smaller size: two cherries per bar, but twice that size is also great). Transfer to a rack if adding the drizzle. Make the drizzle: Gently melt white chocolate in a double boiler or in 20 seconds spans in the microwave. Stir regularly and stop heating just when you can stir the pieces smooth. If desired, whisk in a couple of drops of almond extract. Transfer white chocolate to a pastry bag fitted with a writing tip, or a plastic sandwich bag with a tiny corner cut off. Drizzle over the cookie bars in zigzagged stripes. Let drizzle cool and dry. If desired, transfer cookies into paper cupcake liners to serve. The bars taste lovely at room temperature and are also quite delightful when chilled. Store in a closed container for up to two days at room temperature or up to five days in the fridge. *Maybe next time… I tend to use almond meal that’s milled with the almond skin on (unblanched) — I love those fibrous flecks. But I imagine this recipe would be wonderful with almond flour/meal made from blanched almonds, too. Alongside this, lemon zest would make a lovely swap for orange. As for the drizzle, choose white chocolate with cocoa butter as a main ingredient. Alternatively, a glaze made from powdered sugar and either citrus juice or liqueur would also be scrumptious and easy (Grand Marnier or Kirsch come to mind). To do so, just sift a cup of powdered sugar into a bowl, and add liquid very gradually, by the half-teaspoon, whisking until pourable but thick. This entry was posted in Cookies & Bars, Sweets, Traditional with a Twist and tagged almond paste, bar cookies, blondies, cherries, cherry, sweet almond. Bookmark the permalink. gluten free desserts dairy free -recipes : One of the biggest challenges about becoming gluten-free is to give up these succulent desserts filled with wheat. Let’s face it: rice flour, tapioca starch, potato starch, sorghum, millet, kernel, etc., can not compete with wheat flour. I thought everything was lost when I had to give up those tempting desserts. Fortunately, many of my misconceptions were dissolved because I learned how to modify, experiment and enjoy recipes for gluten-free desserts. These look so delicious! I absolutely adore cherries and also almond, and the combination of them together in this creation of yours both sounds and looks just wonderful! Beautiful photos of them too!